Debt Snowball Bullet Journal Ideas to Help You Get Out of Debt Fast! 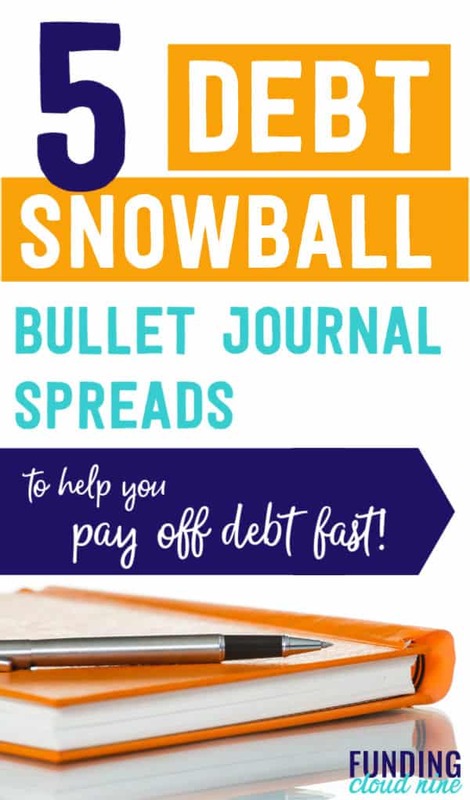 Pay off debt fast with these debt snowball bullet journal ideas! A debt tracker, debt priority list, debt payment recorder and more will help you organize your finances to become debt-free! It’s time for some real talk. Paying off debt isn’t really that fun. From the horror of seeing how much you actually owe, to the utter confusion of how your interest is calculated, to the repeated panic each month as you pay your debt bills, it’s just…not fun. But paying off debt is a necessary task. So in the spirit of making lemonade out of lemons, I was determined to find a way to make getting out of debt a little more exciting. A bullet journal is a creative escape that helps you make.stuff.happen. From weekly planners to bucket lists to habit trackers, a bullet journal has endless possibilities to help you organize and improve your life. And that is why I think it’s the perfect solution to help make your debt-payoff journey a little better. Paying off debt with the Debt Snowball Method helped me get out of an insane amount of student loan debt. That is why I have focused these debt bullet journal ideas on the snowball method. I want to share with you all the supplies I used in the bullet journal spreads below so that you can replicate the colors and look if you want! Leuchtturm Hardcover Medium A5 Dotted Notebook. This is the most popular type of bullet journal, so I decided to splurge a little (I paid $20). This brand has so many beautiful colors and I went with the gorgeous blue color, Azure. A more affordable option (~$11) is the Essentials Dot Matrix Notebook which has amazing reviews because of its thick paper and durable cover. I highly suggest getting a bullet journal with dotted paper because it helps you align your text, pictures, boxes, etc to make things look 1000x better. Fineliner Color Pens Set. I cannot say enough good things about these pens. They are really affordable and are my go-to pens for bullet journaling. I have even started to use the black and blue pens at work! I also have Stabilo pens which are a favorite among bullet journal gurus. Staedtler Colored Pencils. I absolutely love this set of 48 colored pencils. The colors are so pretty, but my favorite part is that the pencils are triangular shaped so they don’t roll off the table (ah, the epitome of first world problems :)) Of course good old Crayola colored pencils will do the trick if you are looking for a more affordable option. Ruler. A ruler is the easiest way to improve the look of your bullet journal spreads. In my opinion, it’s a must-have for bullet journaling. That’s it! You just need a bullet journal, colored pens, colored pencils, and a ruler and you are all set! I’m a major fan of the Debt Snowball Method (thanks Dave Ramsey for introducing this to me!). If you want to read more about this method, head over to my post: Debt Snowball Method: A Complete Guide with Free Printables. You prioritize your debt from smallest balance to largest balance (yes, you completely ignore the interest rate). You pay the minimum payments on all of your debt, but pay extra on your smallest balance (priority #1) debt. Once your smallest balance debt is paid off, you focus on paying off your second smallest balance debt (priority #2). You apply the minimum payment from your smallest debt (since that is already paid off) to your second smallest debt. You continue to snowball payments until your last, highest balance debt is paid off. 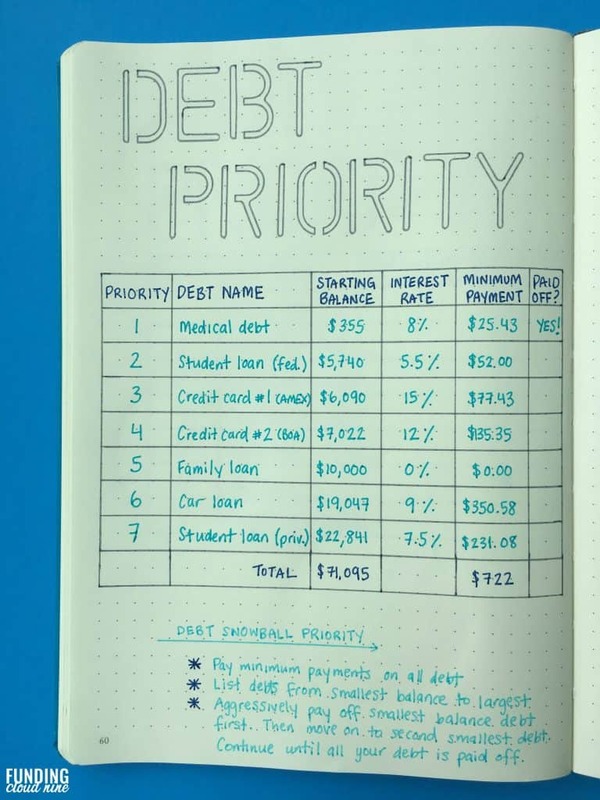 A bullet journal can help you organize your debt-payoff journey. But it can also help motivate you (with a debt tracker) and make sure you keep your eye on the prize (with a spread of your reasons why you want to get out of debt). 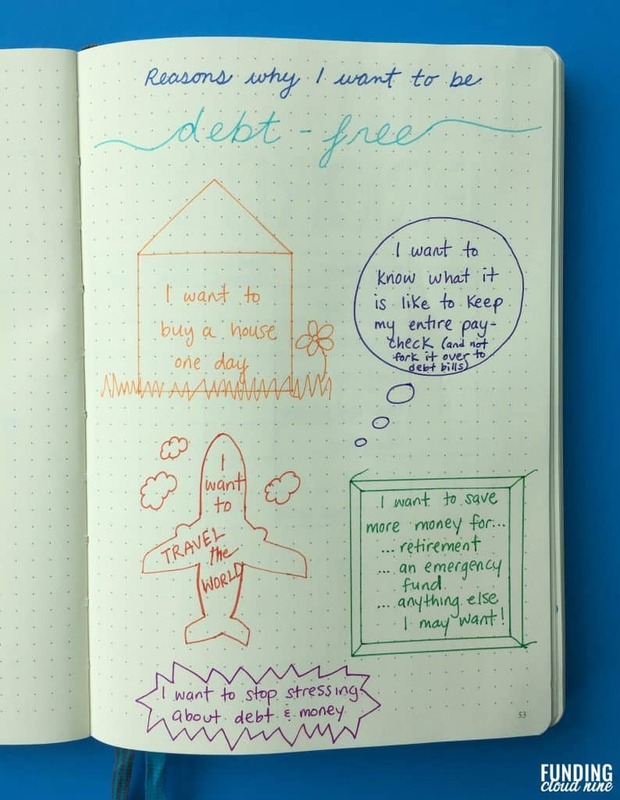 Below are some of my debt snowball bullet journal ideas (quick note: the debts used are just an example…my actual debt balance was a lot higher…whomp whomp). Without a solid reason (or reasons!) why you want to get out of debt, you’re just waffling through this debt-payoff journey. Paying off debt remains a burden instead of means to reach your goals and build your dream life. It’s not enough to just think about why you want to get out of debt. Write every single reason down. You’ll refer to this list numerous times during your debt-free journey, especially when you feel like calling it quits. It provides a quick overview of all your debt. I chose to list the debt name, starting balance, interest rate, minimum payment, and a spot for me to record whether the debt was paid off. It allows you to make a plan for your debt. Since I used the Debt Snowball Method, I prioritized the debt from smallest balance (priority 1) to largest balance (priority 7). There’s nothing more satisfying than seeing that you are one step closer to saying goodbye to your debt. A debt tracker helps you visualize your progress. You can physically see that your money isn’t just disappearing into thin air – it’s actually lowering your debt balance. 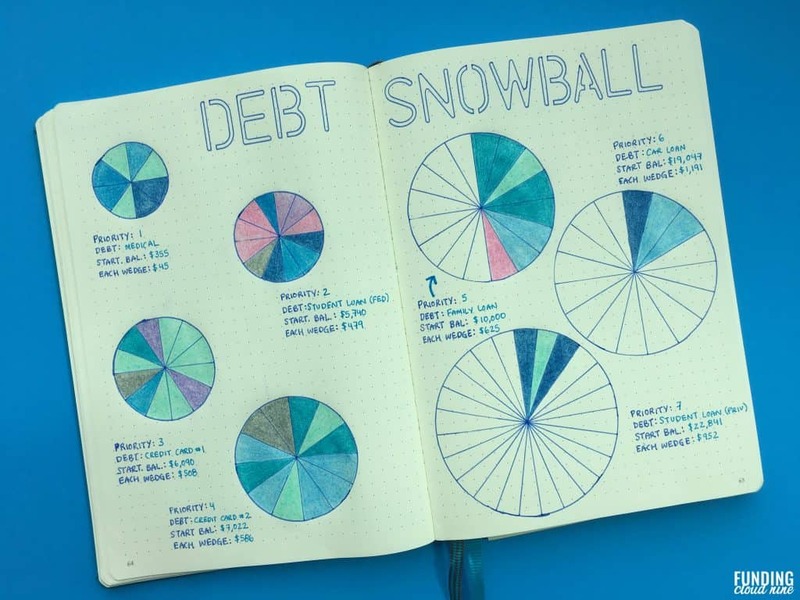 For the debt snowball tracker in my bullet journal, I drew seven snowballs representing the seven debts. I drew the priority 1 debt as the smallest snowball because it had the smallest balance. The largest snowball is the largest debt. I drew a different number of wedges on each snowball (kind of randomly; I just drew what would fit). Then, I calculated how much debt each wedge represented by dividing the starting balance by the number of wedges. Remember that each wedge represents the principal balance paid off. Once you make a payment (which likely includes principal and interest), check to see how much your principal balance was reduced. If it was a wedge-worth, color in a wedge. With lots of debt comes lots of payments. I created a simple table to help you organize all of your debt payments – including your extra snowball payments. Being able to pay off debt quickly doesn’t magically happen. You have to change many aspects of your financial life. To increase those extra debt snowball payments, you must find ways to save more money or make more money. It can be very overwhelming to try to change your finances over night. But it’s a lot more manageable to change one thing about your finances each week. Focusing on one thing each week reduces the pressure you may feel at the start of your debt-free journey. The spread I create below lists a different money habit to change or money challenge to try each week. Some challenges are simple (no eating out at restaurants) and some are a little scarier (asking for a raise). Below are some things I have tried in the past, but you should make your own list tailored to your own financial situation. Paying off debt can feel stressful, disheartening, too mathematical, and just a general buzzkill. But that’s for the ordinary person! For the extraordinary person, paying off debt can be transformed into a creative, motivating piece of art. Let your creativity run wild! 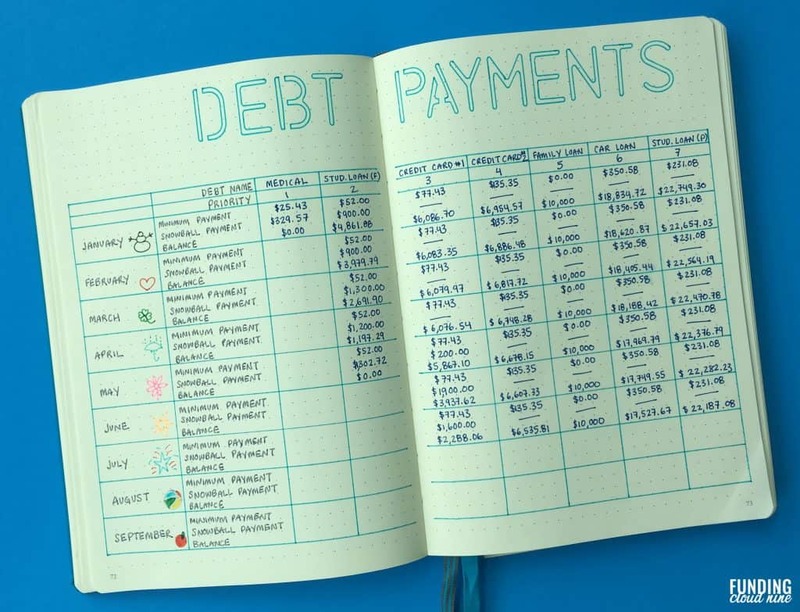 Using a bullet journal to record your debt snowball journey can get you excited to pay off debt and may even help you pay off your debt faster. Are you going to give it a try? 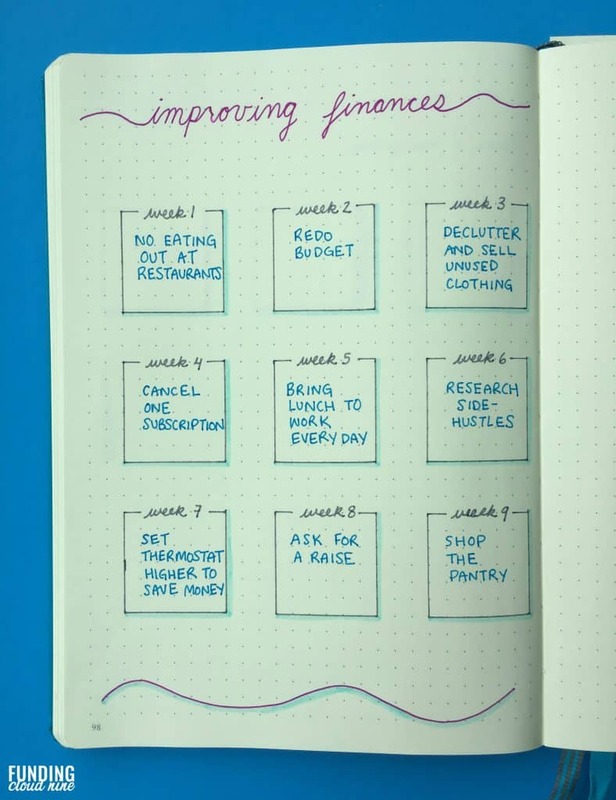 Do you use a bullet journal to help you pay off debt? Wow this is ALOT of awesome information!! Wonderful post! I bought the Essentials Dot Matrix Notebook several months before this post and found it to be an extremely viable option instead of purchasing a more expensive journal. The paper does have a slight bleed. However, it is not enough to get in the way. HI. I get your newsletter and I love your post. So much good info. First, my family and I just moved 2/3 of the way across the country too. (Oregon to Indiana). I am also a blogger (newbie) but haven’t been able to blog all summer due to the move and a four month transition staying with family. Second, I have been wanting to bullet journal and have sort of been doing it with my to-do list. It’s a start lol. Third, my friend gave me Dave Ramsey’s course but I haven’t had time to start it. However, I am on many Dave groups on Facebook and I want to get started working on that. This post came at a great time, just as I am getting settled and back into the swing of things. Oh wow, we do have a lot in common! Wishing you the best!